Product prices and availability are accurate as of 2019-04-22 06:21:32 UTC and are subject to change. Any price and availability information displayed on http://www.amazon.com/ at the time of purchase will apply to the purchase of this product. Living sustainably means realizing that small choices can have a big impact on our environment. 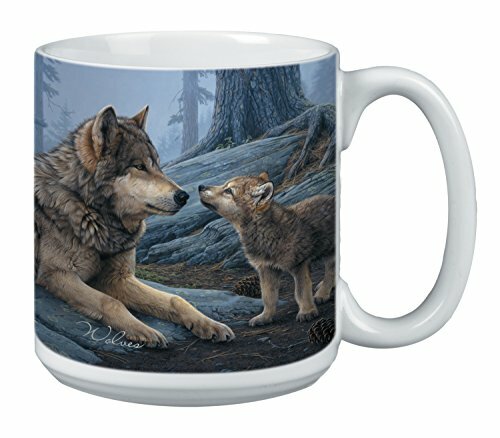 Printed and assembled in the USA, the Tree-Free Greetings Extra Large 20-Ounce Ceramic Coffee Mug is vibrantly printed with hard to find Daniel Smith art, and is great for everyday use. This mug is printed with VOC-free, solvent-free water-based dye and will stay vibrant for the life of the product. The mug is reusable, therefore eliminating any disposable paper or Styrofoam cup waste. BPA free and Proposition 65 compliant, this beautiful, generously sized mug will become an instant favorite. AND it's dishwasher and microwave safe. The Extra Large 20-Ounce Ceramic Coffee Mug makes the perfect gift or souvenir. Save trees and spread joy, buy a Tree-Free gift today. 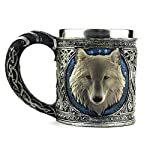 Extra large ceramic mug with comfortable full-sized handle Generous 20-ounce jumbo capacity makes this the perfect cup for coffee, tea or soups Dishwasher and microwave safe; BPA free and proposition 65 compliant Beautiful, colorful wolf themed art makes the perfect present for the special men and women in your life. 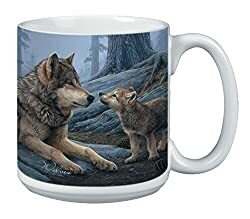 Great for coffee lovers This extra large coffee cup is the perfect Christmas, birthday, or "just because" gift for the wolf lover in your life and guaranteed to bring a smile to their face.